Wei-Ling Gallery presents Yim Yen Sum’s first solo exhibition in Malaysia, ‘The Further You Stand, the Clearer You See,’ between 17th October – 21st November 2018. Awarded the 2016 UOB Painting of the Year (Malaysia) title with her piece The Floating Castle (2016), the artist was honoured with a United Overseas Bank (UOB)-sponsored residency programme in Fukuoka Asian Art Museum, Japan, during which she further developed her soft sculpture practice through the Trace of the City (Hakata) – the People I Met (2017) series. As a young artist, she has worked on a number of public commissions and exhibited in Malaysia, Japan, Taiwan, Korea, and Macau. This new exhibition sheds light on the notion of memories linked to architecture. Intrigued by historical buildings across Malaysia – at the same time distressed by their rapid disappearance – the artist created embroidery patchworks that mix and match portions of different structures as if recycling them into new edifices. In a world in which only those who are in power can write history, she uses her autonomy as an artist in rebuilding monuments by stitching, as a way of preserving memories. The artist observed that similar to the fine threads used for needlework, history is fragile; it can easily be broken into parts. Since the Industrial Revolution, mankind has replaced manual labor with machines. In contrast, Yim Yen Sum adopts a traditional technique that requires time and patience, yet still places it within a contemporary context that reflects on current urban conditions. Through this choice of technique, the artist aims to slow down the fast-paced environment that surrounds us, focusing on the delicate gestures in stitching. Like therapy, her practice slowly brings back certain sensibilities and emotions, which may have long been lost between the narrow apartment corridors, or the busy streets of the city. Through her use of juxtapositions – rebuilding instead of demolishing, decelerating instead of rushing – the artist forms a utopic zone; a self-renewing escape from the overwhelming way of life that our contemporary world seems to offer. Childhood memories inspired the piece The Further You Stand, the Clearer You See (2018), as she invites viewers to focus on a zoomed-in detail of a building’s ventilation wall. As a child, she often played amongst the old buildings that have now been transformed into the Tun Razak City. The fact that different people will have different connections to the image of a ventilation wall fascinates her. As a child, she has explored how its design retains outsiders from seeing the inside of the building; it is impossible to make a judgment purely from the outside. Stepping away from the building, she realized that she could finally see the whole structure of the building; sometimes, we tend to focus on details that we forget to look at the entire picture of a situation from a wider angle. Experimenting with perspectives of viewing architecture, the artist unfolds lessons in perceiving life. 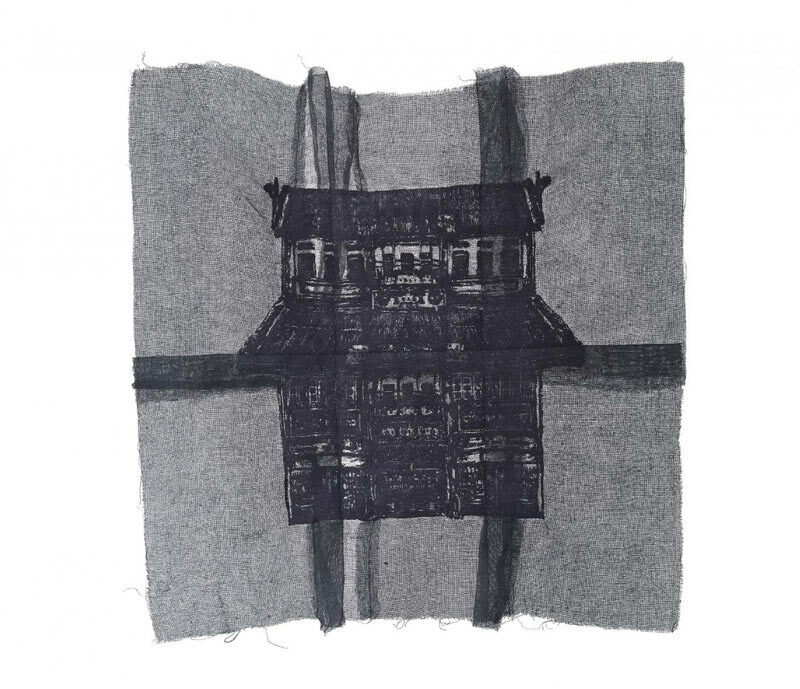 Yim Yen Sum draws the main themes by using fabric as a medium. She believes that “Fabric is the first material that we became familiar with as human beings, that serves as a second skin. It is a form of protection and a metaphor of care.” Black, being a color that absorbs, functions in her work as a symbol of absorbed memories. Her work preserves the past – as for whether positive or negative, it has shaped the time we live in and who we are in the present. ‘The Further You Stand the Clearer You See’ is supported by United Overseas Bank (Malaysia) Bhd (UOB Malaysia). Yin Yen Sum is the 2016 UOB Painting of the Year (Malaysia) award winner and the recipient of the 2016 UOB-Fukuoka Asian Art Museum’s Artists Residency Programme. United Overseas Bank Limited (UOB) is a leading bank in Asia with a global network of more than 500 branches and offices in 19 countries and territories in the Asia Pacific, Europe, and North America. The Bank has had a presence in Malaysia since 1951 and incorporated United Overseas Bank (Malaysia) Bhd (UOB Malaysia) in 1993. The UOB Painting of the Year (POY) Competition underscores UOB’s commitment to support the development of art across Southeast Asia, including in Malaysia. Started in Singapore in 1982 and launched in Malaysia in 2011, the POY Competition is one of the most recognized art competitions in the region. It is held annually in Indonesia, Malaysia, Singapore, and Thailand. For more information on the UOB Painting of the Year Competition, visit www.UOBPOY.com. For further information on UOB Malaysia, visit www.UOB.com.my.